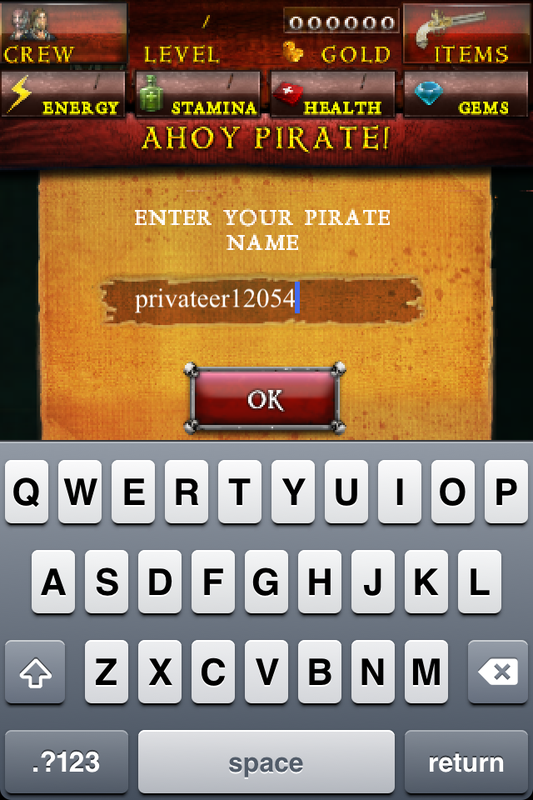 Pirates of the Caribbean: Master of the Seas, is a strategy adventure game for your iPad and iPhone. 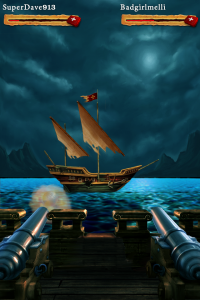 While many of the Wheres My Water and Angry Birds games are more puzzle and skill based, Master of the Seas is much more like World of Warcraft or Neverwinter Nights, in which you are trying to buy weapons and gain experience points. There is also a social aspect to the game, as you can connect with Facebook friends and/or other people playing the game. As part of the game you need to acquire crew, which can cost “gems” or can be other people playing the game. Considering the cost of buying a crew member, there is a strong incentive to team up with other players. 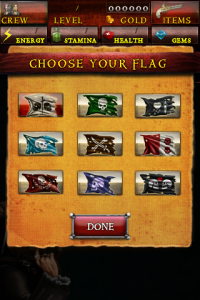 When launching the game the first time, it allows you to choose a name and the flag that will mark your territory as you master the seas. 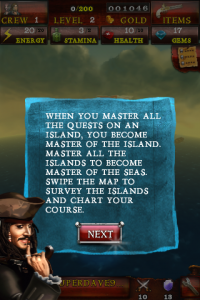 Next, Captain Jack Sparrow takes you through a fairly informative guide of using the app and how the flow of the game works. 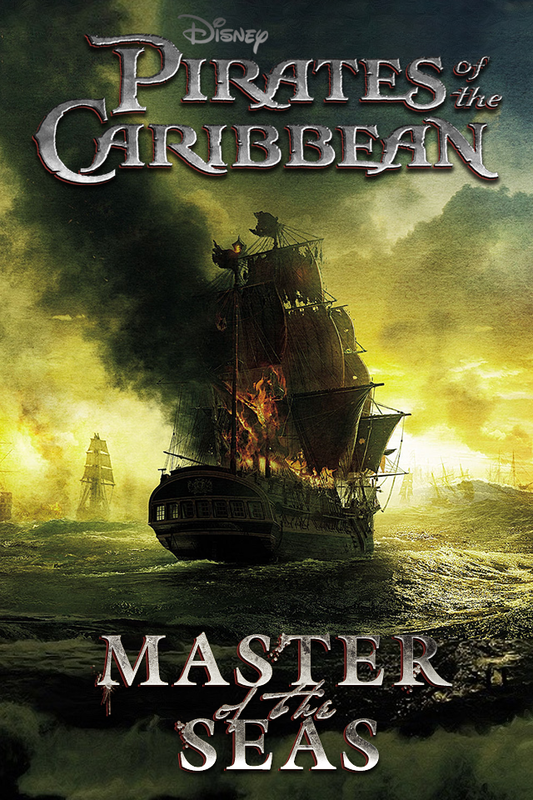 Now it is time to become “Master of the Seas”, by conquering other ships in battle and plundering islands. 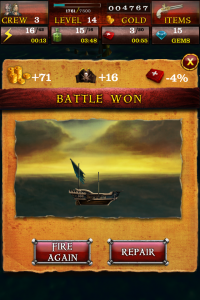 The ship battles entail you firing upon other players, and naturally incurring your own damage as well. You’ll spend Stamina, and Health, which are all consumable and refilled by gold or time. While plundering the islands, you are faced with quests which will require you to make choices of how to accomplish them. While working on quests, you gain experience points and gold at the cost of Energy. Much like Stamina and Health, Energy can be replenished with time or spending Gems that you collect. When I first started playing the game, I was a little confused and surprised by the game play. As I poked around and started to play with it, it quickly became addictive. I did run into a weird issue where I get an error mess saying “This game is not recognized by Game Center”. Either Disney decided not to participate in Game Center, or I have somehow managed to do something wrong. The game has great graphics and very smooth motion while wandering from island to island. If you like these strategy type games, you should give it a try since it is FREE! I didn’t give it 5 stars, due to the repeated errors about Game Center and some early confusion of how to use the game. They are already on version 1.0.2, so they seem to be working on bugs and making improvements. If you don’t mind the “Free with option to pay for additional features” concept and having to invite all your social networking freinds to advance in the game, then this game will suit you fine. Personally I’m tired of this genre as it doesn’t take long to hit a brick wall that requires your wallet to get over. In the case of this game, it looks like if you hook all your social networking freinds to man your crew you might have a chance but sooner or later, you will hit the brick wall anyway of having to shell out $$ for “Gems” to get anywhere. As far as I’m concerned, this is a big Boooooo for Disney who should have released a “free is free” game to promote their movie and stayed out of the deceptive “Free with option to pay for additional features” genre. Admittedly, I had not played far enough to hit the “brick wall” that you mentioned, but I do see it on the horizon. I had figured it was a way to “buy” your way into progressing further, and had not anticipated that it would be the only option at some point. It certainly is misleading. I agree that it would have been better to charge a nominal fee up front, and not have in game purchases like this. I am addicted to this game! However recently i noticed all the energy gifts (the lightning bolts) i have recieved from other players who joined my crew aren’t being credited to my total energy amount!!!!!!! And theirs nothing i can do about it. Must be a bug. Sux cause ifyou play you know you have to wait forever cor your energy to fill up again and if i was was credited what i was gifted id have so much more!!! I have not seen that bug yet, but I’ll certainly keep an eye out for it! Yes, I don’t agree with the fact you can buy gems to advance (cheat) isn’t fair to alot of us who play without paying to get an advantage, as I wouldn’t pay to get more gems. It’s annoying having to wait for energy to come back so i can continue doing quests to master an island, but the game has managed to keep my attention, alittle too much. I am on level 17 and have 7 islands unlocked and mastered. My name is, piratezegledi. Enless I come to some stupid road block that I have to pay for gems to finish the game i will quit then, otherwise i am determined to finish it lol. You can get gems from leveling and from chest and from inviting friends, etc. The “pay wall block” occurs repeatedly. I’m on level 32 and have encountered it twice. 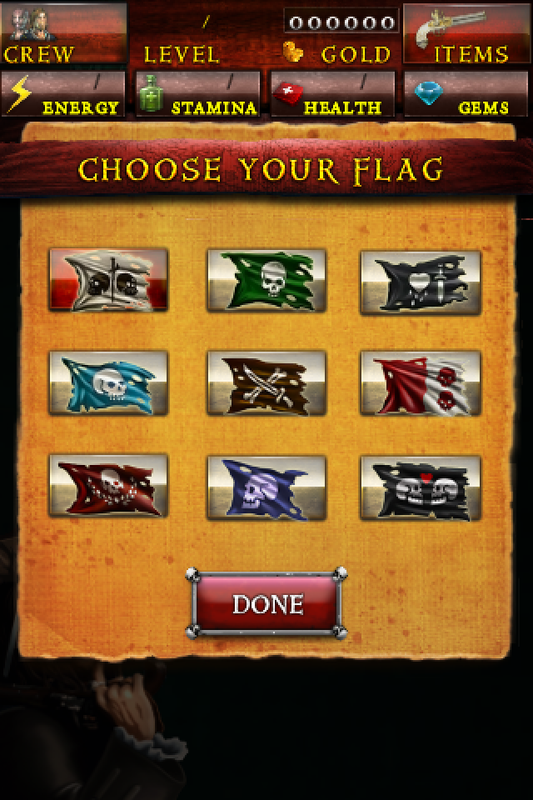 On island 10, one has to come up with 30 gems to buy Norrington’s sword to finish the last task. 30 Gems! I might have had that many if it weren’t for the intentional “Locked chests” that conspicuously pop up when you need gems forcing you to gamble or risk not upgrading. I wish free were free. Or the game charged a nominal fee like $1.99 and you could just play. I like the game but don’t like investing the time and effort into “hitting the wall.” It makes me even more determined NOT to pay. Hear that Disney? I’m not going to give in. I’ll delete the game first. I am annoyed by the not truly free as well. I’ve decided to see how bad it really is. I am on Level 36 and haven’t paid a penny yet. My goal is to see what level I can get to before I absolutely “have to” buy gems. Unfortunately, it means some quests haven’t been completed, but it hasn’t actually stopped my game play. I am on island 13 right now, and continuing forward. I’ll report back when I truly hit the wall. I hope they run the special ghost ship hunt again! That was a very interesting feature! Do you get a problem with battles? I frequently fight people with MUCH lower stats and more cash than myself. Some of the time this pans out just how it should – i win the fight comfortably and get money. But most of the time i attack someone with attack / defense at about 10% of my own who will then completely destroy my ship and cost me a ridiculous amount to repair. Any suggestions?? Thought this was strange too. But if you look at your messages you’ve been attacked simultaneously by another ship. The ship you originally attacked gets the stats posted to your defeat notice, but the other ship really is the one that rocked you. Basically when you upgrade ships, you want to make sure you’re not the ship with the lowest A&D in that class of ship. Otherwise do not pay to heal since you will just get leveled again. Instead, fly under the radar and wait for your health to get to 10% of your total and then attack a weaker ship. It might take a while but you don’t spend a lot on health. sound advice, i’ve been experimenting with a similar technique myself before reading this, it seems to work quite well. Rearding Dawn’s comment about lightning bolt refills: these only refill what you”ve spent in quests, it doesnt actually expand your capacity of bolts. Also, i’m hittin the wall on about level 34… every island now seems to require a large gem purchase to complete a quest… I just shelled out 25, and am working to aquire 30 more and then 45! I dont think i’ll keep playing, its just too much time to put in since each gem takes ages to earn. One tip: if you troll the water picking up shipwrecked items, occasionally you will get 1 gem. Otherwise the brick wall as been hit. Plus i’m using too much data on my phone plan anyways, so it may be time to heave ho! I am level 60 and do not buy gems! The game is all about a huge crew and getting blasted out of the water over and over again. Get about 3,000 crew and spend 17 hours a day on the game and you might get in the top 400. I have a bit over 100,000 (all legit) attack and $100 would only raise it by 10,000 (not to mention your defense is not upgraded) and the top players have over 150,000, and they blast you over and over again and you can do nothing to stop it except remove the game from your iphone in defeat… unless you have a spare $500-$1000 that this game will pirate from you. How do I get on the contest? tried diffrent things none worked. why is my crew shrinking? how can someone be in the top 10 global with a crew of 355 and not to have used an excessive amount of gems???!!!??? Not having answers good or bad causes me to find my own answers, and i’m sure others do it too….please make a question and answer on the game even glitches and resolving issues would be very helpful. The updates were a good step to make this game enjoyable for new pirates up to even the higher ones too. Hi all, my husband and i just started playing the game, I’ve read the pros and cons of the game, how ever we just wanna have fun until our “wall” has been hit:). Anyhow i was wondering how we acquire friends on this game, yes we could always post to facebook but most ppl probably wont play. So if any of you would be so kind as to give us your user name so we may add you that would be awesome. My user name is Nay84 and hubby’s name is Searival, thank you all for your add in advance. check the user comments on the app page in the android market. Everyone posts their user names asking to be added to the crew. I’ve been playing for 5 days and have over 400 crew members through the comments page and adding players that I have attacked, decided not to attack, or attacked me. I too have hit a wall to complete the islands. With the new patch the only way to keep killing the ghostly ship is to buy the packs which i did once only to find that you will need to keep purching as the ghostly ship keeps increasing after each defeatand you need to defeat him 10 times. Was very dispointing. Okay the game is fun at beginning, but it seriously lack of depth. After a while, you just come to realize all you need is a large crew, give out gifts daily and hope to recieve gifts in return. No need to fight or explore to increase your stat, especially since they lift the upper limits on how many piece of equipment you can have in each catagory. I guess I have hit my wall. And as for the ghostly ship contest, it’s such a joke. 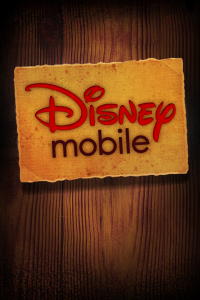 I feel it’s a way for disney get you to spend your money…. At level 60, I need over 3000 gems to buy a pack to beat it, which is like $300. It’s not even close to a reasonable solution, what’s wrong with the programmers? There are plenty good balanced games out there, dont waste your time on this one. 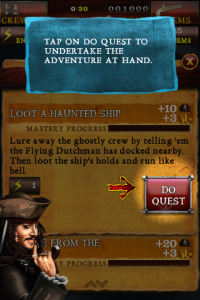 How are you finding this ghost ship? I haven’t seen it anywhere. I’ve been playing this for a while. I ignored the ghost ship – you just lose your gold having to repair. However, I keep losing my health for no reason. Is this a big? Along with the can’t connect to the server issue, this may make me give up and go away! I’ve got to level 50 without sepnding any real cash, but only have a crew of 11 and attack around 3300 and defence around 2600. Not many ships you can defeat with that so battling other pirates is almost a waste of time. Your health goes away as people attack you, whether you are in the app or not. I think the easiest “free” thing you can accomplish is getting more crew. There seems to be some multiplier between your crew and attack. I believe the connection is with the weapons and number of crew required to “operate” them and such. The only wall is your crew size. Just click on a ship write down the name and add them as a friend and hope they accept. I have recieved over 600 gems free by clicking on a sunk ship or the free ones they give every 5 days, just move on to other things till you get enough to buy the item requiring to buy/use gems. giving health or stamina divide 2.5 into your max and you get the max health or stamina you can give. 2 ways to play go 4 experience or stamina. if you go 4 stamina/battle have 10 health more then your max stamina and fight ships that have 1/2 defense then your attack, mostly it will just use 1 health point per battle. you need 1 crew member to man 1x-cannon,weapon,amulet,and tackle, so if you have 100 crew you can have 100 each of cannons, weapons, amulets, and tackles. make sure to buy the first gem shop you get your gems back after 7 days the rest is profits. If you shoot the top 10 leaderboarders you can’t hurt them at all they are more like paper pinatas hit them and money and exp falls out and it seems they don’t get messages that you are attacking them; make sure to hit the weak juicy ones :) . I still don’t like it when they can attack me and take my gold and if I want make him pay for his crime i’m just wacking at a paper target!?! At least make it that the leaders can get real hits through the message board..
Deleat and reload pirates if you get the server issue and don’t do the hd option, and try to use a wi-fi connection not the 3g or data plan. I give to all add me ugalucky. Does anyone get anything good from the locked chests? The best I have done is spending 2 gems and getting back 2 + some gold. I have only had bad things happen to me when opening the locked chests, so I stopped trying them. I dont open any chests unless i have almost no gold or health. Cost you gold to heal from an unknown ship attack, melted gold, or the cargo bomb. The best i get from regular chests is a gem or an item. The locked chests i hate to say is a waste of gems. Wold be nice if there was a list or a chance for a gem item, ive never heard of someone getting a gem item. Secret attack power increase.. In your tackle you have offensive and defensive items. If you had 100 crew you can man 100 cannons, 100 weapons, 100 amulets, 100 tackle defensive and 100 tackle offensive. Now here is my secret to free raising of attack power. Starting with the cannon Culverin not the demi-culverin you have 75 attack power each sell it for 20,000 gold buy 6.67 spankers in the tackle for 3,000 gold each @ 13 attack power: you get 86.67 attack power an increase of 11.67 attack power free!! The pay off just gets better as the level of the cannon goes up…..DON’T FORGET THE LOWLEY SPANKER!! it has increased my attack power by over 23,000. No one else is doing this as far as I can tell looking at others stats. So a secret no more.. at least for mouse net users :P . Oh and don’t forget the crew-item limit add ugalucky if you need to add on another spanker. p.s. at level 60 each new crew member will increase you ultimatly 171 attack and 158 defense not including gem items. I wish I had some of these hints as i was leveling up. you need at least 115 energy to compleat all quests. try to get an energy level of a multiple of 40.. Such as 40,80,120,160,200,240: because the best 2 quests to do once all quests are done costs 40 or 80 energy. The final island gives you good energy and exp at 80 energy each time (15000exp,and 15000gold), but shipwreck cove island on quest “impress Teague” gives you less gold but more exp at 40 energy per quest so using 80 energy you get (16000 exp, and 12000 gold). That said don’t add to defense or offense as you level up; a definate waste of points…trust me. I don’t know about you guys but I would pay real money/gems to “retrain” my level up stats. To bad its not offered. P.s. and I’m sure we all dreamed of getting something like ” YOU GOT 100 GEMS! !”, or a gem item when opening a locked chest, or even saved 20 mates..
oh well to bad you spent 7 gems and got 8,000 gold..sucker! PPS its ok to buy gems, but better i see to spend them on energy or staminia. if you are wanting to be on the leaderboard. just wait till level 60 to do it though. Do you spent any points on ATT or Def when leveling up or just Health, Energy and Stamina? I spent points on defense and att unfortunatly. don’t do it though. I had to learn the hard way and I put some hints down to give people a little help. The more health you have the more it costs gold to recover from it. I didn’t know and assumed it just cost more because I leveled up. Now it costs me 28,890 gold to heal if I get knocked to zero. If you are wanting to go the Experience route shoot for something like 240 energy and the rest on stamina and health.. and have 10 more health then stamina. it seems pretty balanced to me. I have been gifted up to 110 energy which means to me that person has at least 275 energy and almost no health or stamina. also i have been gifted 48 stamina which means the crew member has at least 120 stamina. The reasoning is it costs the same 5 gems to recharge wether you have max 100 energy or max 270.. more bang for the buck you might say. Official way to resolve server issues for i-device. It is said to be caused from multiple apps running in the background. 1. click twice on the home button you will get your running in background app list that you can scroll around in. 2. Hold your finger on 1 of them untill they all wiggle and you get a minus sign in the upper left hand corner. 4. when done touch the home button again on your device and it will stop the option to close running apps. Supposedly a new update today. But I supposedly have space, now I can’t open game. Anyone else have this problem? I can no longer get access to the games since the latest update. I tried reloading the software and it doesnt work. Like dlndz1 said it wont open…it only loads half way and freezes anyone know whats going on? Maybe wait a day? I’ve seen similar things a couple times, and it appears to have been server issues on their end. Hopefully it sorts itself out for you! I dont see a problem with hitting a wall with gem items when playing for free, maybe gameplay has been changed since I started. As long as you spend wisely and buy gem income houses first you’ll be fine, on average i get between 20-30 gems a day at level 47. (this is from leveling, picking up loot, chests and house income). One thing I noticed is the random adding and subtracting of gold/health, it seems the game doesnt run in real time with attacks and gifts etc. When I go into my messages, almost always it takes a few hundred gold off my total. Also ever since hitting level 47 as soon as my health gets to the attack threshhold which seems to be about 6HP 10% of my total HP, I get attacked and sunk by a high level. The same happens as soon as I log in or repair my helath, repair… bam dead again in under 1 minute and different people every time and they aren’t on my friends list or people I’ve attacked. Even happens if I havent attacked anyone for hours (or over a day now, because as soon as i repair im dead again). I thought maybe this is the avenge your sunken friend message that others are retalliating on me but they would have to time it perfectly or have the screen up waiting for me to regenerate health. Anyone else have this happening? Anyway thats my long rant :) add me for daily gifts. Spend bonus points on Energy and get it to 240. Whenever you hit random people, just note dow nthe names and send invites. More crew = win! And, no you never have to pay for anything. Liek the other poster said, save up gems to purchase those gem mines. They add gems slowly, but that’s how you can play it for free. Som islands need you to spend gems to move on. I’ve become the “Master of the Seas” but at this point I don’t see anything to play. I might uninstall it sometime soon. Just make sure to end up with 240 energy at level 60. This gives you the needed amount to do the whirlpool quest (80 energy) 3 times each time it fills up again. Spend the remaining points as you prefer. and earn GEMS from me! The Ghost Ship contest just started up again, and from reading through the comments, it looks like they’ve had it before. I’m wondering, what does the ghost ship look like/how will i be able to recognize it? Will it be sailing around the islands with the normal ships, or will i have to select a normal ship to battle, and scroll through the players, hoping to find it? This “Brick Wall” is easily overcome with something many seem to have little of. It’s called Patience. If you don’t spend all your gems on petty stuff, you can easily build them up to buy the gem generation buildings. Through these collections and leveling up, I’ve never had to pay for gems once and I’m currently at level 43. I know that’s not far along, but it’s far enough along to know that I don’t NEED to buy gems in order to advance. i agree. i haven’t been playing all that long, maybe a few months, and i just reached level 60. i’ve never spent jems on replenishing anything—what a waste! at first, i only spent jems to buy jem mines. i skipped any quest that needed me to purchase an item with jems, and came back to them after i had bought all the jem mines. i also haven’t missed a day playing since i started, so i’ve continuously received the jem bonus every 5 days, which really helps. i also go though and collect the sunken ships around the islands about 20-30 times a day [really!] to collect the jems they sometimes give. so, between the mines, the 5 day bonus, and the sunken ships, i make about 10-15 jems a day. quit complaining, have some patience, and work diligently.